According to Andrew Baggarly a CSN Bay Area contributor, San Francisco Giants third baseman Pablo Sandoval will be placed on the 15 day DL. Sandoval was diagnosed with a strain of the left foot following an MRI on Sunday. 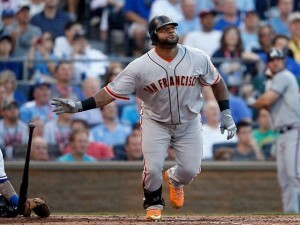 Sandoval is hitting .289 with 8 HR and 37 RBIs this year, aggravated the strain in the game in Arizona on Saturday. Expected to see most of the playing time at third, in Sandoval’s absence, is Joaquin Arias, who is hitting .220 with no home runs and 5 RBIs in 44 games, with 65 plate appearances this season. According to Baggarly Nick Noonan is en route to Pittsburgh, to join the team. Noonan is getting called up after being optioned to triple A Fresno last Saturday. Noonan, had a good April, hitting .333, but in the 22 games since, which includes 6 starts, hit only .114 and was optioned for former top prospect Tony Abreu.